A scientist with NASA’s Operation IceBridge survey program recently spotted a rectangular iceberg floating off the Antarctic Peninsula’s Larsen C ice shelf. Its shape likely indicates that it recently calved, according to NASA, and the ocean has not yet had much time to wear away its corners. The photo quickly took flight on social media. “I thought it was pretty interesting; I often see icebergs with relatively straight edges, but I’ve not really seen one before with two corners at such right angles like this one had,” said senior suport scientist Jeremy Harbeck, who photographed the bergs. “I was actually more interested in capturing the A68 iceberg that we were about to fly over, but I thought this rectangular iceberg was visually interesting and fairly photogenic, so on a lark, I just took a couple photos.” A68 is the massive, Delaware-sized sheet of ice that broke off of Larsen C in July 2017. 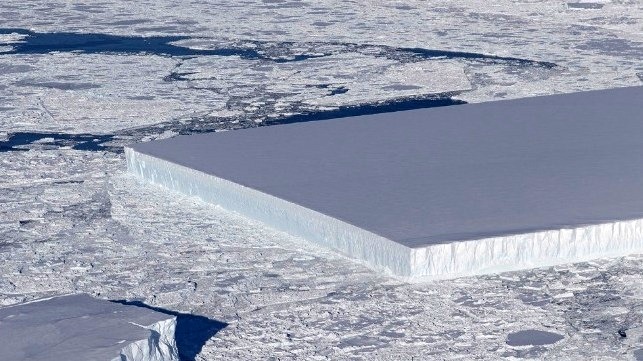 Harbeck’s find is an unusually square example of a tabular iceberg, according to NASA. Tabular icebergs originate from ice shelves, which are broad, flat and regular in shape, and often produce bergs in geometric shapes. Song title thanks to The Mystic Knights of the Oingo Boingo.